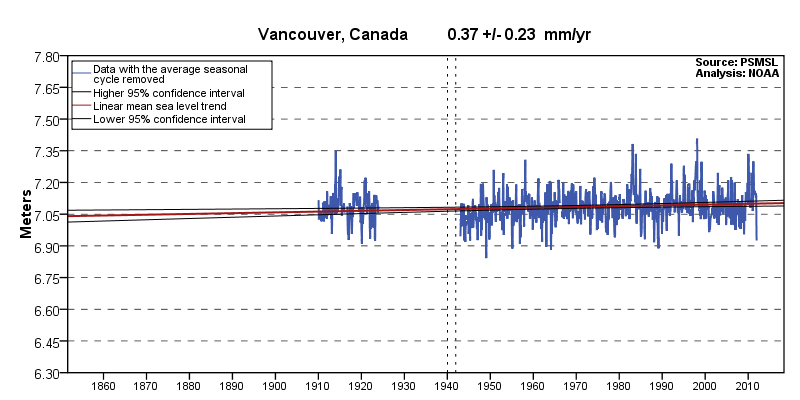 The mean sea level trend is 0.37 millimeters/year with a 95% confidence interval of +/- 0.23 mm/yr based on monthly mean sea level data from 1910 to 2011 which is equivalent to a change of 0.12 feet in 100 years. 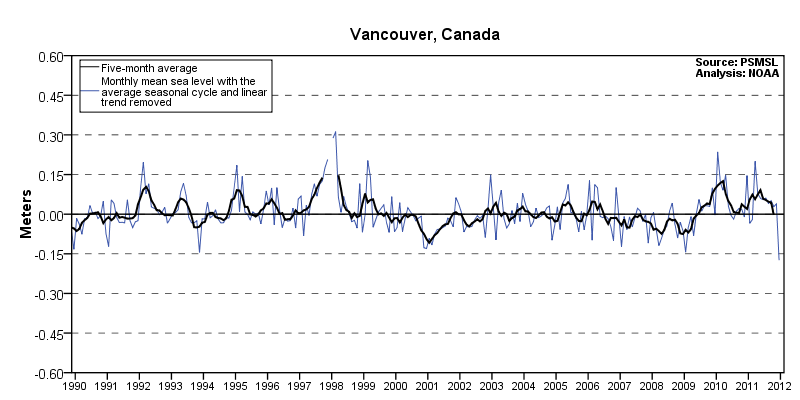 The plot shows the monthly mean sea level without the regular seasonal fluctuations due to coastal ocean temperatures, salinities, winds, atmospheric pressures, and ocean currents. The long-term linear trend is also shown, including its 95% confidence interval. 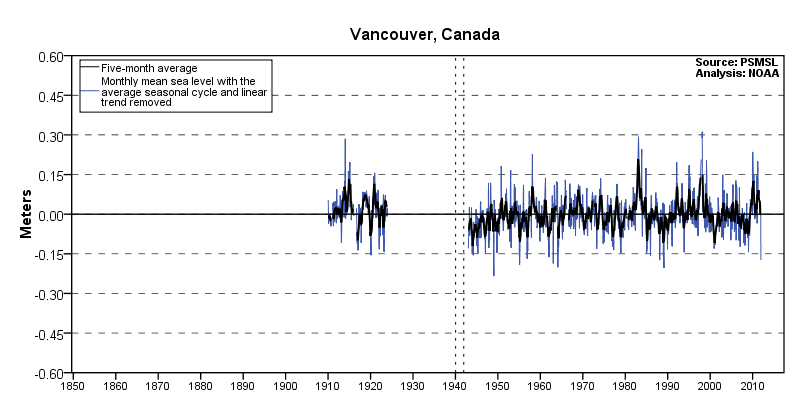 The plotted values are relative to the most recent Mean Sea Level datum established by CO-OPS. The calculated trends for all stations are available as a table in millimeters/year or a table in feet/century (0.3 meters = 1 foot). 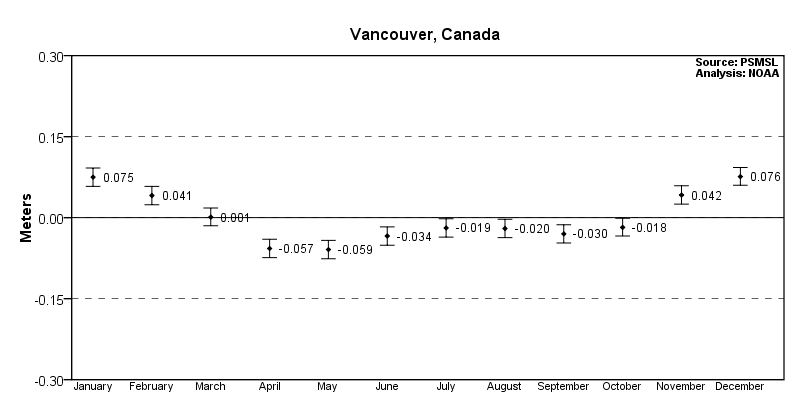 If present, solid vertical lines indicate times of any major earthquakes in the vicinity of the station and dashed vertical lines bracket any periods of questionable data. There are no additional products available for the non-CO-OPS global station: 822-071 Vancouver, Canada.